Where to go to get help for your child with hyperlexia. It seems like yesterday was random hyperlexia support day or something because I was coming across information, requests, and comments about hyperlexia like crazy! First there were some amazing comments, along with some thought provoking questions, on our hyperlexia story blog post. Then the National Autism Association shared an image on their Facebook page about hyperlexia. It was so refreshing to see hyperlexia highlighted in such a manner! And not by me for a change! All I could think was, "It's about time!" Then later in the evening, a blogging friend sent me a message about a mother in her support group looking for more information about hyperlexia as her child was just diagnosed. This one definitely hit me hard. Because regardless of how much I have written and shared about hyperlexia in the past two years, obviously it is still difficult for those needing the information to actually find it. I know what it is like to be in this mother's shoes. The new diagnosis is overwhelming. The lack of information is frustrating. There's confusion, maybe shock. There's maybe even happy tears shed because finally...finally, there's an answer to describe and explain their child. 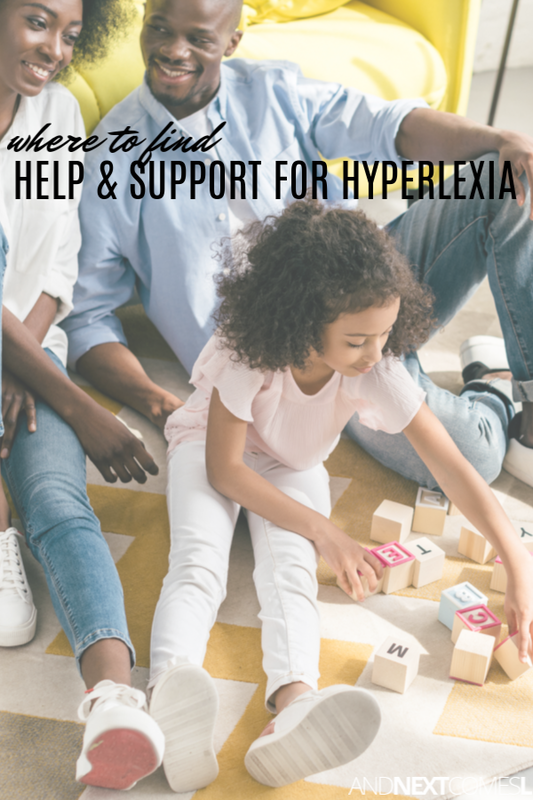 So to this mother, and all other mothers out there who are in this same position, the same one I was in two years ago, here is what you need to get the help and support your child with hyperlexia needs, as well as the help and support you need as a parent. Wow, I got a wee bit passionate there, didn't I? There are many therapeutic options available for kids with hyperlexia. However, not all professionals will necessarily have experience with hyperlexia and oftentimes, they may not have heard of hyperlexia. Shocking, I know...You may need to educate them on what hyperlexia is. You can see my tips for advocating here. Since most kids with hyperlexia also have the autism diagnosis, a lot of parents seek out various types of autism therapy, such as ABA or occupational therapy. So search for professionals and therapy options that suit your child's needs. Those needs could be speech related, sensory related, social skills related, etc. I find it extremely helpful to talk to others who just get it. Others who are raising children with hyperlexia. It's nice to know we're not alone and that others understand the unique abilities and challenges that go along with hyperlexia. You know, instead of people thinking we are bragging constantly or that we drilled our kids with flashcards as babies...yeah, you've had those conversations too? I bet you have! 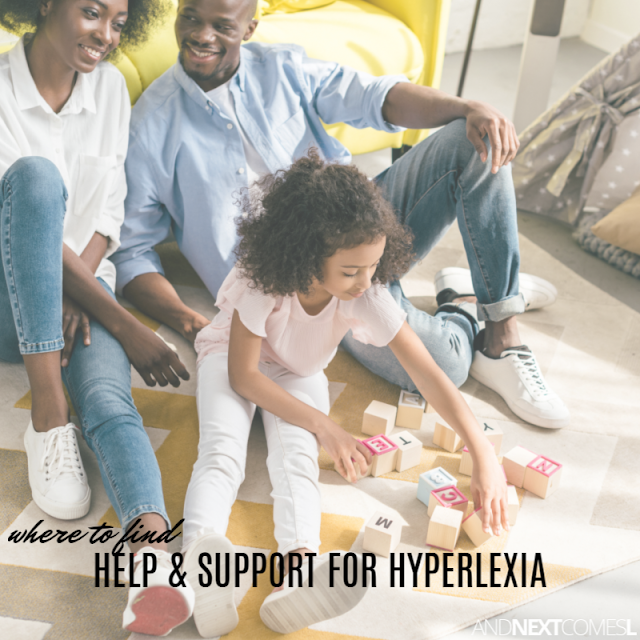 Hyperlexia + Autism Support Group for And Next Comes L - Come join my small community of parents who have children with hyperlexia and/or autism. There's a wide variety of topics discussed on a regular basis and you occasionally get sneak peeks from me, including Facebook live videos, tips, and photos of our day to day life that I don't share elsewhere. I also crowd source information from this group for blog posts (kind of like I did for this one!). Hyperlexia Parents Network on Facebook - This group is amazing! It is an extremely active group that celebrates the unique quirks and talents of our hyperlexic kids, while offering amazing support, regardless of what stage or age you are at in your hyperlexic journey. Highly recommend joining this group as it is an amazing resource for parents. There is also a group dedicated to Hyperlexia Type III (without ASD), but I am not an active member of this group, so it is hard to share my thoughts on it. But it is available as well and may be worth checking out. Hope you find these resources and ideas helpful!